Sudan is on my radar screen now. I am in the process of preparing a trip across northern Sudan that will take me into Egypt. This should take me a couple of weeks. This also means I will drop out of communication a bit, not to worry, I will return with new stories and photos. 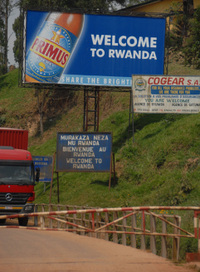 I’ve come to Rwanda to come to terms with something within myself. The genocide of 1994 happened within my lifetime. I remember it happening, I remember seeing the images, not understanding it and detaching myself from it. It was beyond my comprehension and ability to do anything, so I went into some kind of resignation about it and let it go. I dashed into the Kivu Province of the DRC (Democratic Republic of the Congo) for a week, basing myself out of Goma. Goma is nothing to write home about. Except it has a couple of interesting things to offer, one you can see gorillas in the DRC from here on short notice, most people want a more stable place to see them. And second, it is one of the few places you can climb an active volcano and sleep on its lip. I choose to do the first, given I have seen an active volcano in Costa Rica, although I did toy with the idea for a bit, but the $200 dollar fee was too much for my budget. 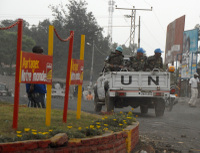 Knowing nothing about Congo’s past, I crossed the border with an open mind and naivety. I have since learned about the turbulent past of this part of the Congo, and the current challenges that face this part of the world. Here you can see a house in Goma, half submerged from the 2002 eruption.